We have traditional homes on well-apportioned lots with one cul-de-sac street dedicated to lovely garden homes accented by a subtle landscaped common area. The subdivision shares the Woodland Hills park, which has two covered playgrounds, covered picnic area, swing set, and a scenic walking loop. 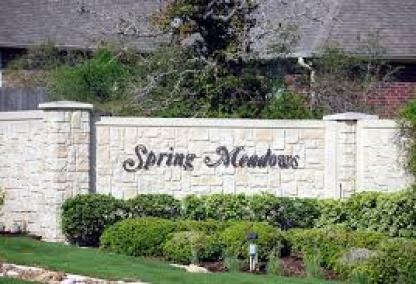 With a single entrance, four total streets, plenty of sidewalks, and wide roadways, Spring Meadows’ design naturally cultivates a friendly atmosphere of neighbors visiting and enjoying the outdoors!